In the late 1970s, cultural theorist Michel de Certeau wrote an essay, "Walking in the City," that begins with the author standing at the top of the World Trade Center looking out over Manhattan. From this vantage point, the city is offered up as a whole, graspable image, in contrast with the messy, meandering city that one moves through down below. "Down below" is the realm of lived experience, inhabited by walkers, Wandersmanner, who use and transform space, defying the geometrical discipline imposed by urban development, of which the World Trade Center stood as the most monumental of figures. This is an exhibition about walking in the city. But not all of the artists included here engage in walking; some squat, some stand still, one awkwardly attempts to scale buildings. "Walking" is an ordinary but transformative way of using space, for which we might substitute any number of other spatial practices. The works gathered here are first and foremost acts of spatial appropriation. For de Certeau, walking is a form of enunciation, akin to a speech act. Like figurative language, which strays from literal meaning, walking, squatting, or scaling stray from proper places, introducing new significations, ambiguities, and voices into an existing spatial system. The spatial practices represented here reference a long legacy of avant-garde wandering, from that paradig- matically modern figure, the 19th-century flaneur, to the aleatory drifting of the Surrealists and Situationists. But if these earlier moments in the (art) history of walking evince an easy spatial and social mobility or a sense of touristic privilege, the more contemporary works point to the heterogeneity of lived experience, a global unevenness articulated locally through the stubborn insistence of the body. For artists working in the charged social climate of the late 60s and 70s, urban space signified revolutionary possibilities. Such was the context for many of Yayoi Kusama's highly publicized and politicized happenings. In 1966, the artist performed Walking Piece, a work that enigmatically raises questions about the status of the immigrant or stranger, and the city as a space of difference. Theatrically deploying a stereotype of exotic femininity, Kusama wandered the industrial outskirts of Manhattan dressed in a kimono, sheltering herself beneath a flowery parasol. One image depicts the artist encountering a sleeping homeless man. Walking in the city here finds a troubling cognate in homelessness, a different kind of migratory practice that eludes attachment. Adrian Piper's video, Mythic Being (1973), negotiates the permeable division between public and private realms, as it intersects with race and gender. Dressing herself as a socially threatening black male, wearing a moustache and afro wig, Piper moves slowly down the street, repeating a line from her personal diary like a mantra. A group of passers-by gathers behind her--kids make faces at the camera, adults stare perplexedly. Piper's work thus refuses the dignity accorded the autonomous, discrete work of art, instead taking its place on the street, existing in frictional relationship to the people encountered there. In her Body Configurations series (1972-76), Valie Export repeatedly photographed herself amidst the architectural monuments that encircle Vienna, frozen in contorted poses. These photographs stage a different kind of masquerade than Piper's. Here the body appears vulnerable, in danger of being engulfed or petrified by the city. Export's performance/photography critically negotiates the psychically fraught relationship of the female body to the city. Ultimately the body remains resistant, unable to conform to its surroundings, challenging the assumed rationality of architectural planning. De Certeau tells us that walking is sometimes like dreaming. In Arthur Rimbaud in New York (1978-79), David Wojnarowicz photographed his friend and lover, Brian Butterick, disguised as the French Symbolist poet. Wearing a mask, a facsimile of Rimbaud's face, this figure appears as a phantom, haunting the city's deviant spaces: underneath bridges, piers, red light districts, run-down apartments. Like the return of repressed, the emergence of this phantasmatic figure asserts a right to a public life for marginalized groups and their refusal to be removed from urban reality. For these artists of the 1960s and 70s, the city emerged as an arena in which art might begin to confront publicly the radical differences of lived experiences. The more contemporary works featured here reference this history self-consciously, engaging the strategies of Export, Kusama, Piper, and Wojnarowicz as models for working through and re-imagining politics and poetics within the everyday. Displaying a more tempered optimism toward the public sphere than their predecessors, these artists engage in what might be called ethnographic investigations into the individual resistances of everyday space. They examine our tenuous sense of community as it is mediated by real estate interests,planning and zoning laws, and the desire for a unified public. (1) Rather than seeking to transform the uncertain, unruly urban terrain into something readable, these contemporary artists negotiate the profound disorder and fragmentation that city bureaucracy and community interests work to deny. Their efforts reveal not so much an attempt to make their socio-political identities stand out from the fabric of the city, as to direct attention to the global realignment of borders and redistributions of capital that produce this urban fabric. Simon Leung's Squatting Project/Berlin was conceived to comment on the expulsion of Germany's immigrant Vietnamese population in 1992. Developed as posters for bus stops throughout Berlin, Leung took his visual cues from the squatting position assumed by people in Asian and other non-western populations, as well as the notion of claiming residency in an unoccupied building. Echoing Export's (non-) conformist postures, Leung's squatting also recalls Wojnarowicz's masked Rimbaud, inhabiting improper places. Leung's project makes visible a population that had not been allowed to squat, and was instead quietly being exiled from both the cultural habits of the body and a chosen place of refuge. In Upward Mobility, Alex Villar incorporates his body into urban architecture in unexpected ways. Challenging the means by which city planning forces our movement in a particular trajectory, Villar explores the terrains of New York and London architecture by attempting to traverse buildings vertically. At once a futile gesture and a grasping for freedom, Villar climbs bus stops, buildings, scaffolding, and railings. Throughout his work, Villar, like Export, insinuates his body into the small spaces that remain unused by most city inhabitants. Upward Mobility pushes this notion further as it reveals the restrictions that are placed on our freedom of movement by the built environment and the regulation of city planning. In the video installation, A Needle Woman, Kim Sooja is seen from the back, standing motionless facing a bustling urban street. These scenes are set off against serene images of the artist lying on a rock. In the city, her stillness emphasizes the urban chaos and distances her from the constant stream of people. By the rock, however, Kim's quietude takes on a contemplative, even spiritual aspect, suggesting that the source of her reserve within the city is strength rather than catatonia. In both Kim's video and Kusama's slides, the figure stands out against an urban background. While Kusama foregrounds the uncertain place of foreignness within an indifferent city, Kim contrasts the verticality of her body with the constantly fluctuating shapes and colors of the anonymous crowd, suggesting a more internal articulation of space. Valerie Tevere's interactive DVD project, A Preliminary Guide to Public and Private Space in Amsterdam, is an idiosyncratic mapping of Amsterdam based on citizens' perceptions of private and public space. Through interviews with residents, Tevere creates a map determined by (seemingly) arbitrarily chosen public and private spots, delimiting various alternative routes through the city based on the practices of individual walkers. Like Piper, Tevere explores the interpenetration of public and private spheres, emphasizing as well chance encounters and the creative appropriation of space by its users. For the work's audience, navigating the interactive format of Tevere's DVD project mirrors the actual walking in the city. Like her colleagues in this exhibition, Tevere's work makes visible clandestine paths through the city, illuminating diverse modes of mobility. Seen through the lens of earlier urban performance, this contemporary art makes manifest the imbrications of the subject and the urban environment, and the struggle to find agency within regulated spaces. 1. Rosalyn Deutsche's pioneering book, Evictions: Art and Spatial Politics, has been foundational in thinking through this project. In the late 1970s, cultural theorist Michel de Certeau wrote the essay, "Walking in the City," which begins with the author standing at the top of the World Trade Center looking out over Manhattan. From this vantage point, the city is offered up as a whole, graspable image, in contrast with the messy, meandering city that one moves through down below. Throughout the second half of the twentieth century, artists have engaged these contrasting views of the city, negotiating the simultaneously coherent and chaotic urban terrain via the immediate and kinetic media of performance, photography, and video. In the contemporary moment, there has been a resurgence of interest in understanding human and artistic agency within the mediated, contradictory spaces of the city. The exhibition Walking in the City examines the work of eight contemporary artists. Simon Leung, Kim Sooja, Valerie Tevere and Alex Villar highlight their engagement with strategies developed by artists throughout the past forty years, including Valie Export, Yayoi Kusama, Adrian Piper and David Wojnarowicz. The latter group of artists explore their concerns with resisting and negotiating regulated space in order to position themselves within a public, urban environment. The works in the exhibition constitute acts of spatial appropriation. Not all of the artists engage in literal walking; some squat, some stand still, one awkwardly, attempts to scale buildings. Walking in the City is thus an ordinary but transformative way of using space, for which we might substitute any number of other spatial practices. The curators of the exhibition are both PhD candidates in Art History at Stanford University, California. 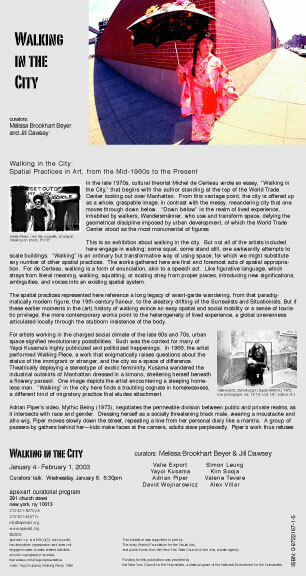 Jill Dawsey, a critical studies fellow in the Whitney Independent Study Program in 2000-2001, currently resides in San Francisco and is working on her dissertation concerning "street works" by women artists of the late 1960s and 70s. Melissa Brookhart Beyer is finishing her dissertation on audience dynamics in contemporary performance. She recently curated Space Vehicles, opening January 30, in Houston and lives in New York City. A curators' talk will take place in the gallery on Wednesday, January 8, 2003 at 6:30 pm. *This exhibition has been selected from the Unsolicited Proposal process.